It has taken Microsoft quite a long time to finally introduce a decent tablet to challenge the iPad. But the company did announce it was bringing two new tablets to the market by the time Windows 8 hits the market. The non-pro Surface is only 9.3mm thick and weighs 1.5 lbs. It has a 10.6 inch screen with a 1920 * 1080 display. It will run Windows RT and have microSD, USB 2.0, and 2×2 MIMO antennae. The Microsoft Surface has a VaporMg case and stand. The company claims these tablets will have the very best WiFi reception of any tablet available on the market today. 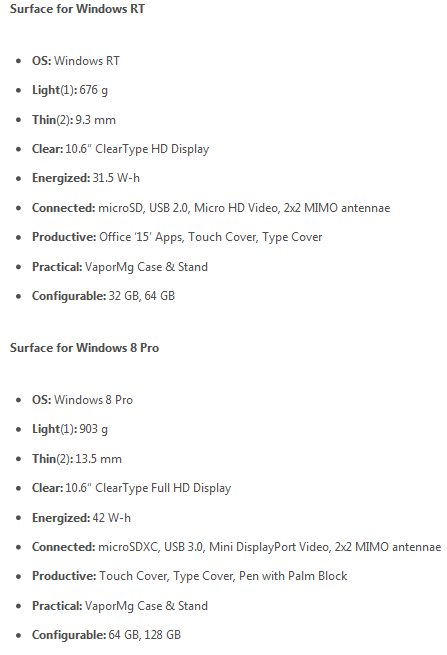 The Pro version of Surface has an Ivy Bridge Core i5 x86 processor inside with USB 3.0 and more goodies. It will be a bit thicker and could have up to 128 GB of storage. Surface’s cover is pretty cool. It is a magnetic case with a thin keyboard and multi-touch trackpad. But we don’t know a whole lot more about these. If you watch the above video, you will realize that Microsoft tries so hard to call these PCs and not tablets. Unfortunately, Microsoft did not reveal a whole lot about pricing. These are expected to be competitive with a comparable ARM tablet or Intel Ultrabook-class PC. While it is true that Microsoft has a sleek tablet on its hands, it has ways to go to challenge the iPad. Price and apps are going to be very important for consumers. We still don’t know about the battery life of these tablets. We will have to wait a while to see how these tablets perform. What impressed you the most about Microsoft’s tablets? Want to Port Your iPhone Apps to Windows Mobile?